Students from Mark Twain I.S. 239 studied salamanders on Staten Island this week. “Be careful!” shouted a seventh grader from Coney Island’s Mark Twain Intermediate School 239 for the Gifted and Talented. “Don’t grab him by the tail,” warned another. “I think he’s scared,” said a third. The students were gathered around a red-backed salamander deep in the woods on Staten Island. A shiny black squiggle, it was jumping around in the cupped hands of their teacher, Aimee Kemp, who was determined to show them how she could tell it was a male. New York City used to be salamander central, but while the red-backed salamander still thrives under rocks and logs, other species have disappeared. The tiger salamander was gone by the 1930s, the marbled salamander by the 1970s. The four-toed salamander was last spotted in 1979. These days, the northern dusky salamander is found in only one location in Manhattan, Highbridge Park in Upper Manhattan, while the spotted and northern red salamanders are considered rare. Concern about their decline in the area is not merely academic. Salamanders help protect woodlands by eating the bugs and grubs that consume leaf litter, which provides a habitat as well as crucial nutrients and moisture for wildlife and young plants. Highly sensitive to changes in the environment, salamanders are also important indicators of overall forest condition. 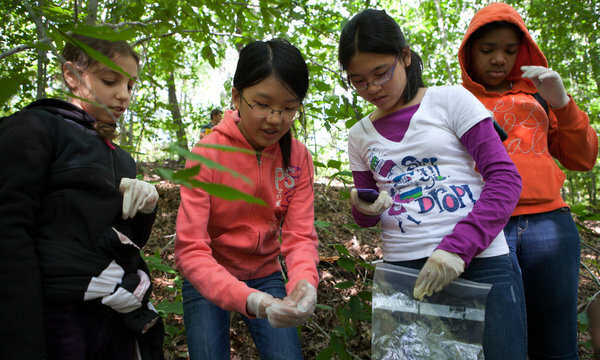 So in an ambitious citizen-science project, the city’s Department of Parks and Recreation has enlisted scores of seventh graders from public and private schools to study salamanders in the wild — or what passes for the wild in New York. On a crisp fall day, five large groups of students fanned out to parks in four boroughs, with the group led by Ms. Kemp heading to High Rock Park in Staten Island’s Greenbelt. They outlined 100-square-meter transects, or sections of land, and recorded each salamander: its species, size and cover object (logs, rocks or leaf litter). They also noted other amphibians, like frogs, as well as insects, spiders and earthworms. Despite their recent vulnerability, salamanders make ideal research subjects for children, in part because they are easy to find. “People don’t take them seriously because they’re small, cute and kind of common,” said Ellen Pehek, the parks department’s principal research ecologist. “But their commonness is precisely why we study them. The same students also went on a field trip to Black Rock Forest in the Hudson Highlands, 50 miles north of the city, in September to document salamanders there. In addition to the red-backed salamander, Ms. Kemp’s students uncovered the eastern newt, while other school groups found salamanders of the slimy, northern two-lined, northern red and four-toed species. The groups will now return to the classroom and enter their data on computers, giving the city’s scientists fresh comparisons between urban salamanders and their country cousins. The data will feed into continuing research that Dr. Pehek and others have done on salamanders in newly restored woodland areas in Inwood Hill Park in Manhattan. There, from 2001 to 2003, the parks department removed invasive plant species like vines and honeysuckle bushes. Researchers found that, at first, bigger, feistier salamanders retreated to untouched sections of forest, claiming that territory for themselves. The smaller, more defenseless salamanders remained in the newly restored area, but over time, the larger ones returned to join them. That meant the salamanders were able to overcome the initial disruption of the restoration, which will ultimately improve their habitat.